Nissan's New Mobility Concept may join the Leaf as part of the automaker's EV range. LISBON -- Nissan is planning to launch three more electric vehicles besides the Leaf hatchback. By 2014, there will be an electric delivery van and a sporty subcompact for the Infiniti brand, in addition to the Leaf, said Pierre Loing, Nissan Europe's head of product planning/electric vehicles. "This is only the starting signal for the manufacture of an entire electric vehicle family," Loing said at a press event here for the five-door Leaf compact. Francois Bancon, Nissan general manager for exploratory & advanced product, said at the same event that Nissan will produce another EV as unconventional as the Qashqai and Juke crossovers. The new model will be based on the LandGlider concept car. The two-seat model was displayed at the Tokyo auto show in 2009. On Nov. 1, Nissan revealed more about the two-seat EV when it released pictures and details of its New Mobility Concept. 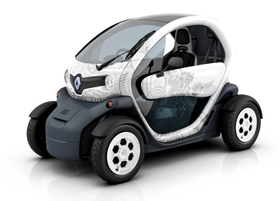 The concept is similar to the Twizy electric vehicle that Renault will launch in 2011. In both vehicles the passenger sits behind the driver. Both have a range of a 100 km (62 miles), and maximum speed of 75km (47 miles) per hour. Nissan will launch the Leaf in the United States and Japan in late December. In early 2011, the first European buyers will take delivery of their Leaf, starting with Portugal, the UK, Ireland and the Netherlands. Nissan chose those countries because their governments will offer subsidies of up to 5,000 euros (about $7,000) to buyers of electric vehicles. In the second wave, the French, Spanish, Danish and Swiss markets will get the Leaf, starting in mid-2011. The Leaf likely will launch in Germany at the start of 2012. Nissan plans to build 250,000 Leafs a year with 150,000 annual capacity at its U.S. plant in Smyrna, Tennessee and 50,000 each at factories in Sunderland, England, and Oppama, Japan. 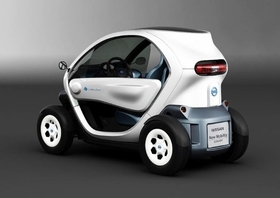 Nissan's New Mobility Concept is similar to the Renault Twizy, shown. Renault-Nissan say they will spent 4 billion euros (about $5.6 billion) to launch up to eight different EVs in at least five key segments. Without being more specific, the alliance partners have said they aim to have EV production capacity of 500,000 units in the next few years.